The other day most of the town was coated in thick fog, but now and again we would find these pockets where the sun was shining through. Very surreal standing firmly on the ground staring straight into a cloud. This is the smoke from a cement factory, rising above the fog. reminds me of the movie brazil for some reason. very surreal. kinda creepy. 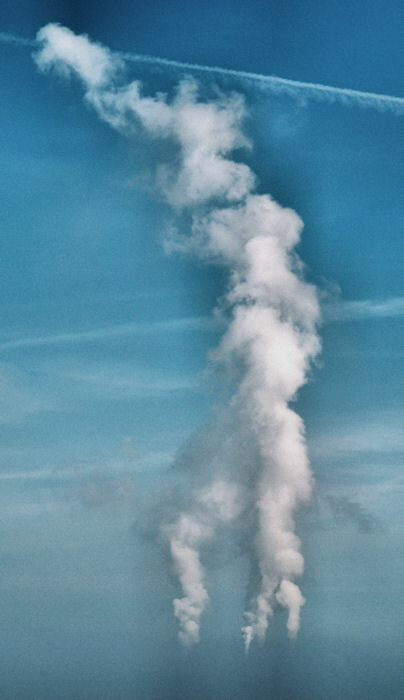 Nice shot: the confluence of the smoke/steam is fascinating. I see a figure emerge from the cloud as I gaze at it.